To be able to break down the results in Insights you can use the Filter box and its predefined filtering options. Start the filtering by clicking the box and picking Category. If you wish to investigate a single search query. Can be used for either a specific query or for studying words that are part of longer queries. If you wish to compare queries based on a certain number of performed queries. If you wish to look at queries with a certain number of clicks. 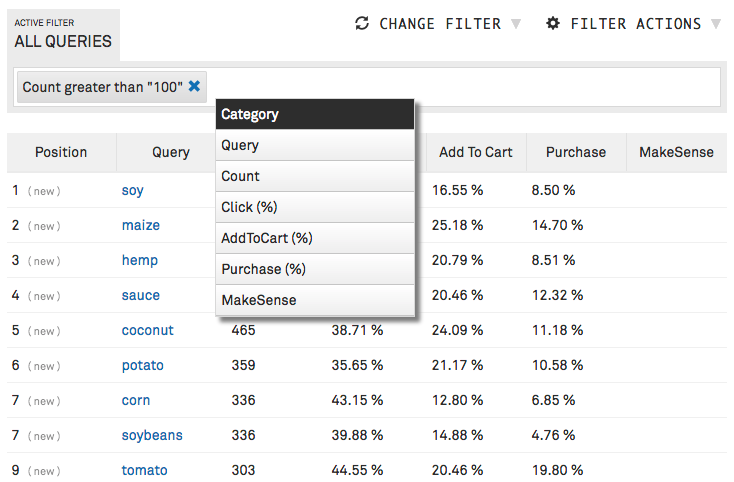 If you wish to look at queries with a certain number of add-to-cart. If you wish to look at queries with a certain number of purchases. This means that the engine couldn’t understand the search query as is. This does not necessarily mean that we haven't show any products to the visitor, but it does mean that the exact word(s) used in the search query was not found within the metadata of any of the products in the catalogue. When this happens, the engine flags the query as a MakeSense = False and attempts to interpret it by making significant changes to the word(s). The engine tries to break a word down into several words, traversing back through the query until it finds a word that has a match in the catalogue. If the engine still can not find a match from sub-words, then it will drastically edit the search phrase (e.g. by swapping letters, replacing letters, etc.). After choosing a filter you apply an operator to steer how the filter should be used. Read more here on how to Save filters.